Watch Badgers from a Hide in Tewin on Monday 22nd or Wednesday 24th June at 9pm sharp for a minimum donation of £5 per adult (£3 per child). The sett has over 10 badgers and you may also see foxes, muntjac deer, bats and owls. Silence is the key as badgers have very good hearing and will remain hidden if they are suspicious of noisy intruders - even whispers can be heard several metres away. They also have a good sense of smell. Badger watchers need to dress warmly as sitting still in the evening can be a dramatic contrast to the daytime warmth and to choose dark clothing to be inconspicuous. 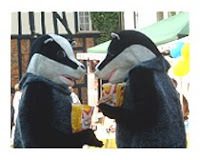 To join the Badger Watch this Welwyn Festival Week, telephone 01438 798722. It's a busy week for the WFG Chair! STOP PRESS. Fire at The Wellington. Air Ambulance Quiz - almost ready!